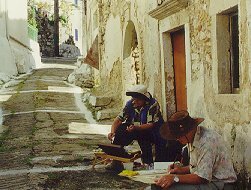 CORFU DISCOVERY TOURS - with Australian artist Warren Curry - The Island of Corfu.. Situated in the Ionian Sea only a few kms off the west coast of the Greek mainland. The Island measures 58 km in length and 27 km across at its widest point. 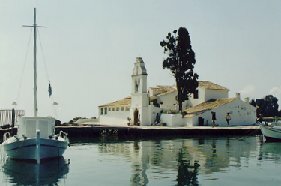 Corfu is the greenest and has a reputation as the most picturesque of all the Greek Islands. The western shores consist of rugged headlands and beautiful beaches, with the north being dominated by the majestic slopes of Mount Pandokrater. Shimmering silver olive trees, figs, oranges and grapes grow abundantly in the clear light, and mild climate. Bougainvillea and wisteria cascade down the stone walls into the narrow village streets. Turquoise waters lapping rocky coves, sunny beaches and over one hundred traditional villages make this island a true artists paradise. In spring the weather is mild with temperatures in the low to mid 20's, making it ideal for painting on location. During springtime the landscape is transformed by the myriad of wildflowers that carpet the countryside. Autumn is also quite mild with temperatures similar to spring. Corfu in autumn is a time of the olive harvest and family winemaking. 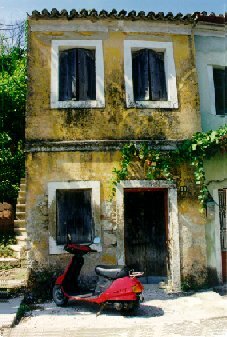 Pelekas is a picturesque hillside village situated on the west central coast 12 kms from Corfu Town. The Village is located 270 meters above sea level and enjoys spectacular views of the Mesis region of central Corfu. Located only a short distance away, and famous for crystal clear water and golden sands, are the beaches of Kontogialos, Glyfada and Yaliskari. Pelekas has population of approx 800, and while it enjoys the advantage of modern services, it still manages to retain the charm of traditional village life. The villagers' possess a genuine warmth and friendliness rarely experienced with the pace of today's society. Created by FatMan Graphics, Yarram, 3971. Original artwork copyright W.Curry. Curry Studios Homepage.